Side story: Mini Sengoku Basara Two: Tsukiyo no Katakura-kun, Sengoku Basara Two: Ryuko, Itadaki no Chikai! Atsuki Mirai e Kakeru Tamashii!! There are also a couple of surprises here like a ghostly apparition (?) and some people who we thought are dead but seemingly are not... nani?! On a side note and it kinda went something like: "once he swings that hot spear, i just cannot keep my cool" or "i would like to see how he holds those spears"... was this intentional or does the subs need improvement? am i missing something?!? I know that this anime has hot guys in it but if this continues then maybe it's a sign that it's time to throw in some women! But not like Kasuga or Ichi, for goodness sake! Maybe more like Matsu... This is Samurai Kings not Queens, right?! darn it! FIRST OF ALL MUST SEE SENGOKU BASARA !! Before watching this season!! I saw the first season which was really awesome!! But this seasons comes up with more territory war against one another again. 3. More fights that are a must see!! 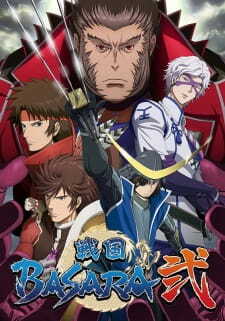 6.More action based on Date Masamune, even team work with someone who is similar to him. Later on Date's right eye is captured....by a certain someone from another clan...and the defeating of that clan from ruling Japan. Great work on the armor, swords , battle ship ,flying and not making it look 3D that it kills your interest sometimes.great scenery that doesn't make it so cheesy in some scenes!! For Date Masamune never stops being so awesome and never get tired of him by far best character in the series! !Many new characters that you get to see 2 of which you see all late about it. Enjoyment is high with Date Masamune's part of the story,looking for his right eye man Katakura. By far I enjoyed this series even though I started to see the movie first then this wished I saw the season 1 and 2. ( well that's me ) that's why. I warned to see the first and second season first.I enjoyed the 2nd season most because it was mostly based on Date Masamune and he himself finished Hideyoshi by his own epicness!! ARE YOU READY GUYS? PUT THE GUNS ON! LET'S PARTY~! Season 1 of the Sengoku Basara anime over a year ago was my first foray into the Sengoku Basara franchise. I've never played any of the games up until this point, though I have pre-ordered the North American version of "Sengoku Basara: Samurai Heroes" (known in Japan simply as "Sengoku Basara 3"), as well as the first season of the anime on BD. I'm surprised this series got licensed, but you'll hear no complaints from me! Sengoku Basara is a rare gem. Although I haven't played any of the games yet, I do know that most video game-based animes tend to dilute the original content, and merely seek to milk the successes of the franchise in the anime market. You know, a cash cow. However, I and many others who have witnessed the glory of this and the still-airing second season can say without a doubt, that this is an anime everyone should be watching. It's too bad it seems to fly in fairly low under the radar in comparison to most of the other shows airing this season. However, maybe this review will help to get it some well-deserved attention. This isn't a show you watch for the story, or at least, not for a deep plot. The most you'll get plot-wise from this anime is the development of the war between the various feuding nations, some strategic insight into what each of the various groups plan to do, and some twists and turns involving the outcomes of said plans. However, the best part of Basara is that it doesn't attempt to complicate itself or force the viewer to have to remember specifically what's going on; you'll find yourself more than content just going with the flow. As such, the plot falls short of anything more than average, but it makes up for it by remaining concise and to the point. Don't worry about it too much: You're not meant to. Very few shows get a budget so big as to allow them to really shine. In Basara, you'll see no cheap backgrounds, no long runs of still-frames; you'll see nothing that's not breath-taking at least once every couple of minutes. The battle scenes are top-notch, over-the-top, fluent, and extremely well choreographed (as far as any anime can be choreographed). Watch it and see for yourself. There's really nothing more that can be said. Think Tengen Toppa Gurren Lagann, only much more polished and elegant. The music fits the mood and represents the time period in which the story is supposedly set (that is, the music is "traditional" most of the time), yet Basara is not afraid to whip out the odd rock track and turn it up a notch when the situation is appropriate. It's the perfect blend of music when the time calls for it that immerses you in the traditional period of the samurai, and of simpler times, but it calls you back to the action when necessary with blood-pumping, high-tempo riffs that fire up the man inside of you. Simply amazing. In terms of individual character development, there isn't anyone that really starts at a point and grows. I suppose Yukimura Sanada would be the closest thing to a character who starts out young and inexperienced, and the one we see grow the most to become a leader in his own right. However, in a show like Basara where you have a myriad of original characters, all extremely different and unique, it's hard to give the spotlight to just one or two and grow them up in only 12 short episodes (per season). But it didn't bother me much at all, I still rooted for Masamune Date whenever I could get the chance. The characters are all so likable, and well positioned in their respective roles that you feel like you know them already. So while Basara is technically a little weak in the "development" department, it remains strong in presenting a wide cast of original, likable characters in such a short episodic run. This is no simple feat, and deserves credit. You'll even find yourself rooting for the enemy sometimes because they're so damned cool. Basara is all about enjoyment, really. This is where it shines. There's nothing more fun than seeing two opponents jump off their horses, shoot up into the sky in a blaze of colors, and engage one another in a battle of epic proportions, completely blowing away any nearby bodies in their vicinity. There's nothing more epic than seeing a lone samurai get so fired up that he PUNCHES THE OCEAN AWAY with his bare fist. Does it sound ridiculous to you? Of course it does! That's what it's all about: Ridiculous, epic, over-the-top, hot-blooded manly action. You thought Tengen Toppa Gurren Lagann was at times enjoyable, even if it made no sense? Then if you're not watching Sengoku Basara, you're missing out. You really are. There are many more epic moments you'd find yourself pausing the episode to re-watch, even before moving on because you thought it was so awesome. That's a quality essential to any good anime: One that leaves you wanting even more. It's really a rare trait in today's industry of "security", where companies know that all they have to do is put out generic moe garbage, and their business can... Well, stay in business. Thank goodness for taking risks, Basara. It's what makes you stand out above the crowd. I wanted to give this a 10 pretty badly, but it does have it's flaws. I'm not going to dwell on them, but if it has one single-biggest flaw, it would be such a short episode count. If each season were able to hold up a solid stack of 26 episodes each, then the characters and the plot would have more time to be fleshed out more appropriately. It's not bad for half that count, and arguably the show would be degraded if it ran on *too* long, but that's my opinion on the matter. Otherwise, it's a great watch. This is definitely the most underrated show of 2010, and it's too bad it's not getting more attention, at least in terms of outward appreciation. I'm sure there's a lot of people who simply watch it every week and don't bother to discuss it much, and I can sort of understand. It's not the type of show you spend a lot of time discussing, you mostly watch it for the thrills, and repeat week after week until it's over. Then move on. While there's nothing wrong with that, it's unfortunate that mediocre shows such as K-ON! seem to attract much more attention than rare gems such as Sengoku Basara. I would even go so far as to say that Highschool of the Dead (airing along with this show in the same season at the time of this writing), a show that doesn't come nearly as close in terms of production values and has even less of a plot, is somehow apparently able to cast a popularity shadow over Basara. It might just be that Basara doesn't appeal to as many people as HotD does, but if that's the case, then anime really is in trouble in the coming years. Let's hope the fanbase realizes that shows such as Basara are worth watching, and worth supporting. Basara at least reminds me of a time when anime was original, when studios and producers weren't afraid to step outside the known formulas and mix things up. Sure, it's based off a video game, but in my eyes, the fact that it can be this good with that being the case means that the execution was probably about as flawless as one could hope for, given the challenges of creating such an entertaining product from another product's already existing formula and ideas, and managing to add it's own spin on the materials while remaining original in it's own way. No easy feat, and unquestionably deserving of high regard within the anime fandom. If you haven't seen this show or the previous season yet, do yourself a favor as a fan of the anime genre: Go and watch it now. Dip your feet in, you won't regret it. And if you do, well, then stick to your precious K-ON! and keep wishing for a second season of Angel Beats. YOU JUST DON'T GOT YOUR GUNS ON. To the rest of you, GET YOUR GUNS ON. You dont have to be a novice to the Sengoku Basara series (because I'm not) or a newbie to the anime culture either to enjoy this anime with its amazing battle war cry's. At first glance (from the original Sengoku Basara anime) I was hooked from day 1, the animation pensmenship was so detailed, you could tell this was'nt a cheap knock off of sorts. The fight scene's were brutally and powerfully animated (and thankfully not subjected to replaying the same actions over and over again). After the first series had finished, I waited (for a seriously long amount of time) with other anime fans by my side too, and the day finally arrived. Sengoku Basara Ni (Or 2, if you'd like to call it), kept everything at a vantage point from its predecessor, the full blitz and blownout battle field wielding all its former glory of hack and slash action was everything I waited for. I've watched upto the latest ep so far, and I truly recommend this for anyone who's looking for a climatic story with fierce competion.